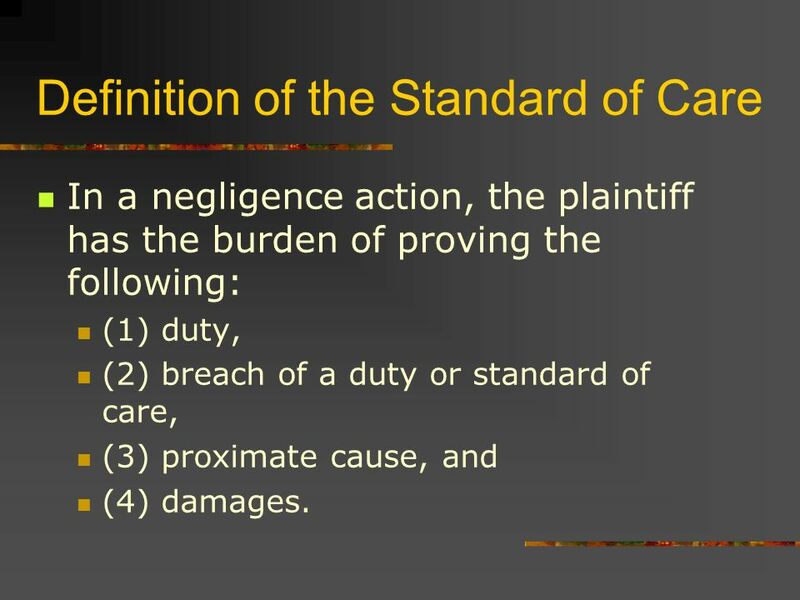 4 Definition of the Standard of Care In a negligence action, the plaintiff has the burden of proving the following: (1) duty, (2) breach of a duty or standard of care, (3) proximate cause, and (4) damages. 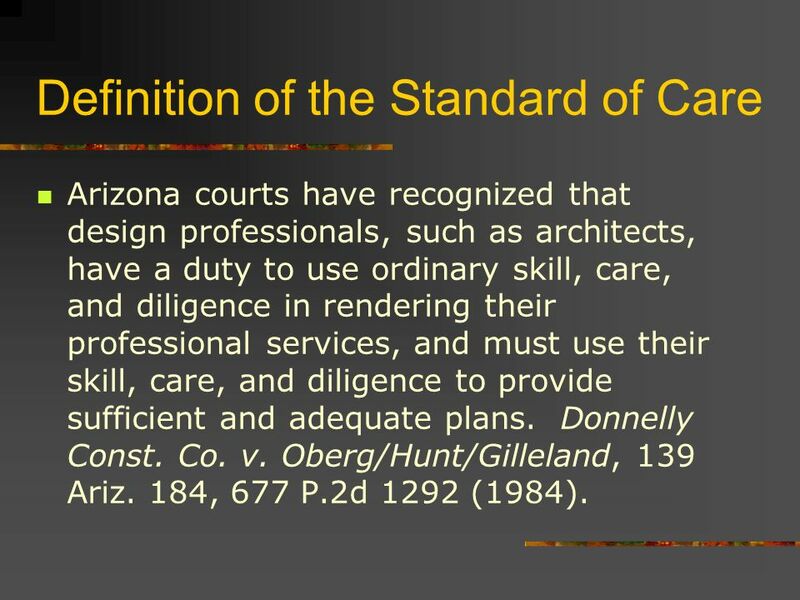 5 Definition of the Standard of Care Arizona courts have recognized that design professionals, such as architects, have a duty to use ordinary skill, care, and diligence in rendering their professional services, and must use their skill, care, and diligence to provide sufficient and adequate plans. Donnelly Const. Co. v. Oberg/Hunt/Gilleland, 139 Ariz. 184, 677 P.2d 1292 (1984). 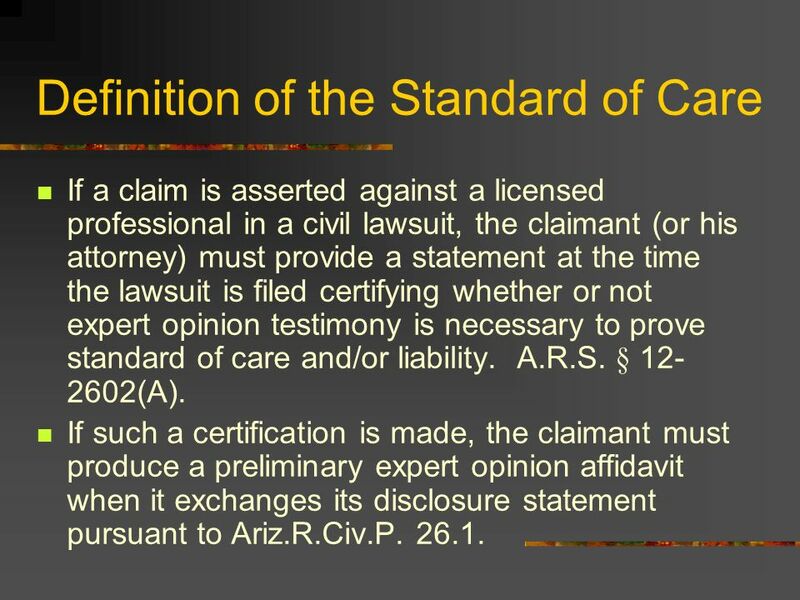 6 Definition of the Standard of Care If a claim is asserted against a licensed professional in a civil lawsuit, the claimant (or his attorney) must provide a statement at the time the lawsuit is filed certifying whether or not expert opinion testimony is necessary to prove standard of care and/or liability. A.R.S. § 12- 2602(A). If such a certification is made, the claimant must produce a preliminary expert opinion affidavit when it exchanges its disclosure statement pursuant to Ariz.R.Civ.P. 26.1. 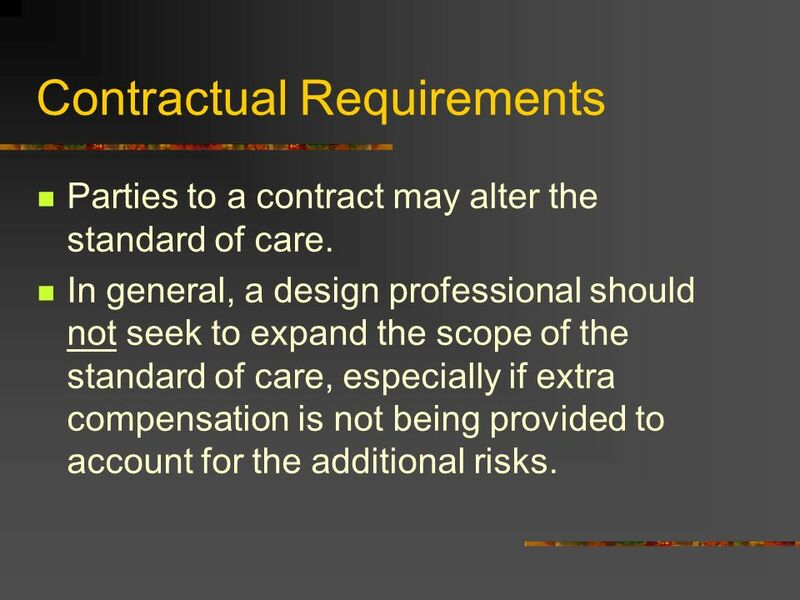 7 Contractual Requirements Parties to a contract may alter the standard of care. 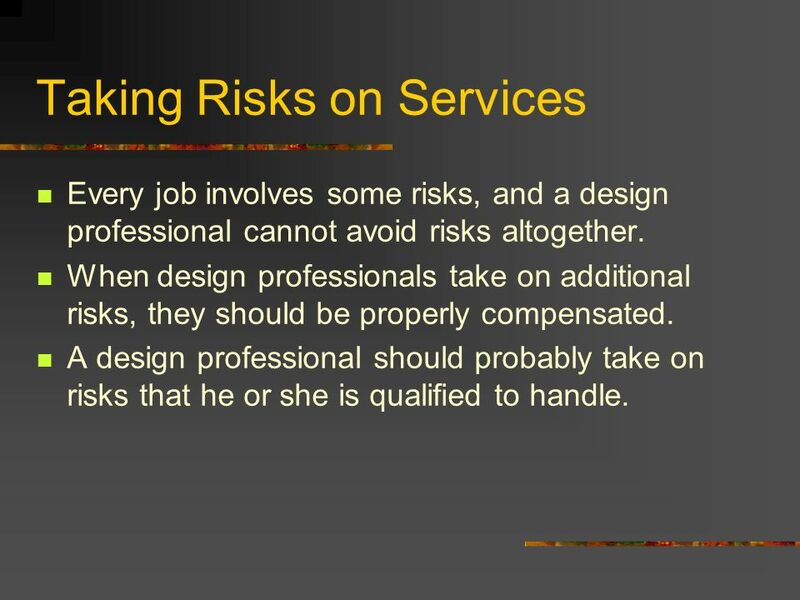 In general, a design professional should not seek to expand the scope of the standard of care, especially if extra compensation is not being provided to account for the additional risks. 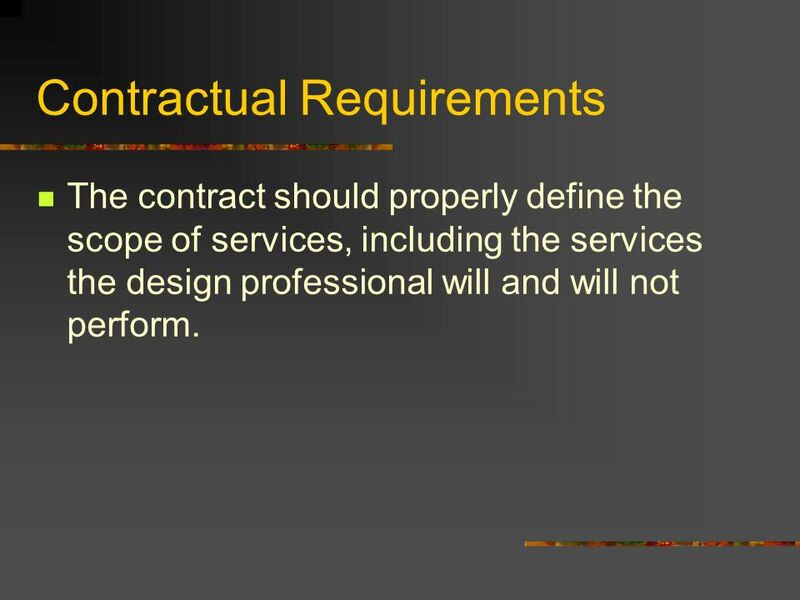 8 Contractual Requirements The contract should properly define the scope of services, including the services the design professional will and will not perform. 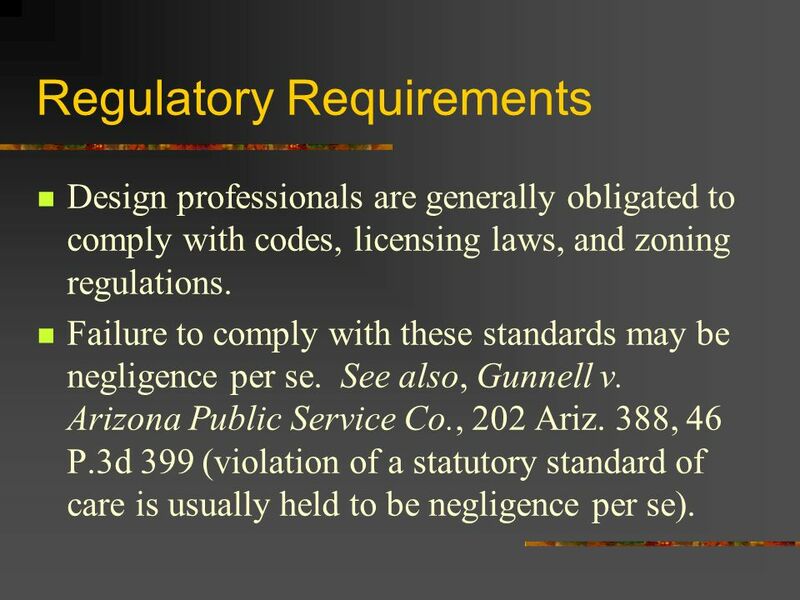 9 Regulatory Requirements Design professionals are generally obligated to comply with codes, licensing laws, and zoning regulations. Failure to comply with these standards may be negligence per se. See also, Gunnell v. Arizona Public Service Co., 202 Ariz. 388, 46 P.3d 399 (violation of a statutory standard of care is usually held to be negligence per se). 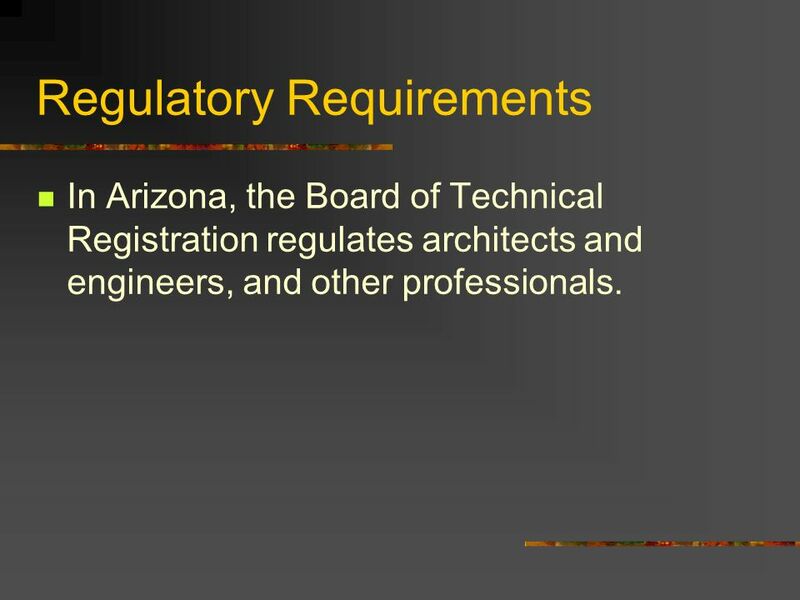 10 Regulatory Requirements In Arizona, the Board of Technical Registration regulates architects and engineers, and other professionals. 11 Regulatory Requirements The general purpose of the Board of Technical Registration is to provide for the safety, health and welfare of the public through the promulgation and enforcement of standards of qualification for those individuals registered or certified and seeking registration or certification. A.R.S. § 32-101(A). 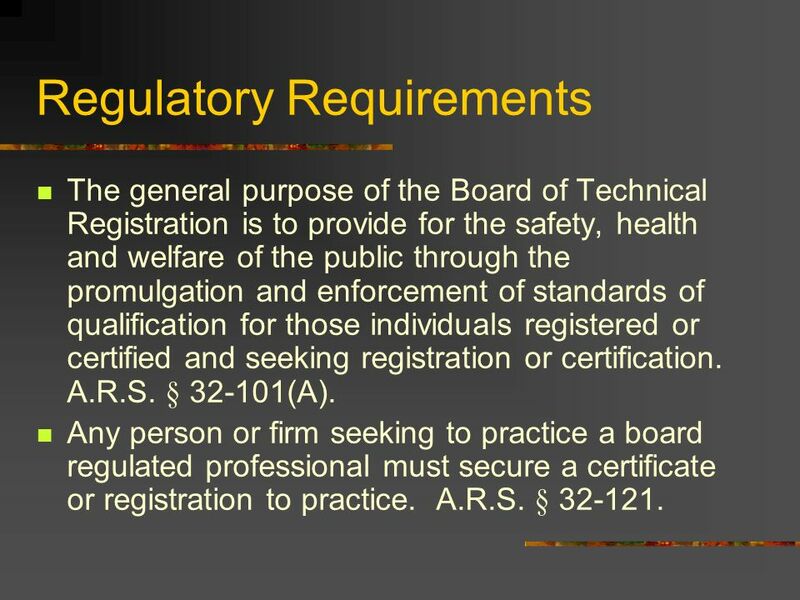 Any person or firm seeking to practice a board regulated professional must secure a certificate or registration to practice. A.R.S. § 32-121. 12 Regulatory Requirements Section A.A.C. 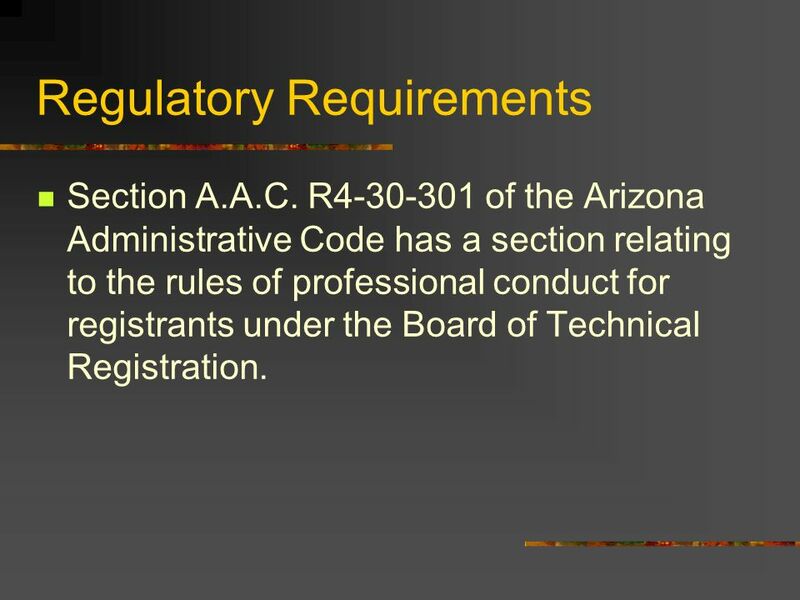 R4-30-301 of the Arizona Administrative Code has a section relating to the rules of professional conduct for registrants under the Board of Technical Registration. 13 Taking Risks on Services Every job involves some risks, and a design professional cannot avoid risks altogether. When design professionals take on additional risks, they should be properly compensated. A design professional should probably take on risks that he or she is qualified to handle. 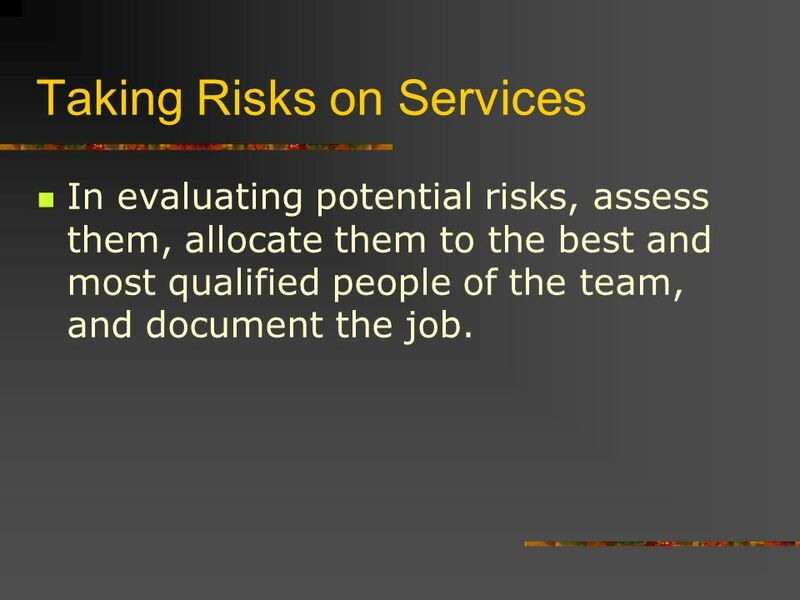 14 Taking Risks on Services In evaluating potential risks, assess them, allocate them to the best and most qualified people of the team, and document the job. 16 A Defensive Practice Approach for Design Professionals Closely examine the contract, and make sure it properly defines the roles and responsibilities of the parties. 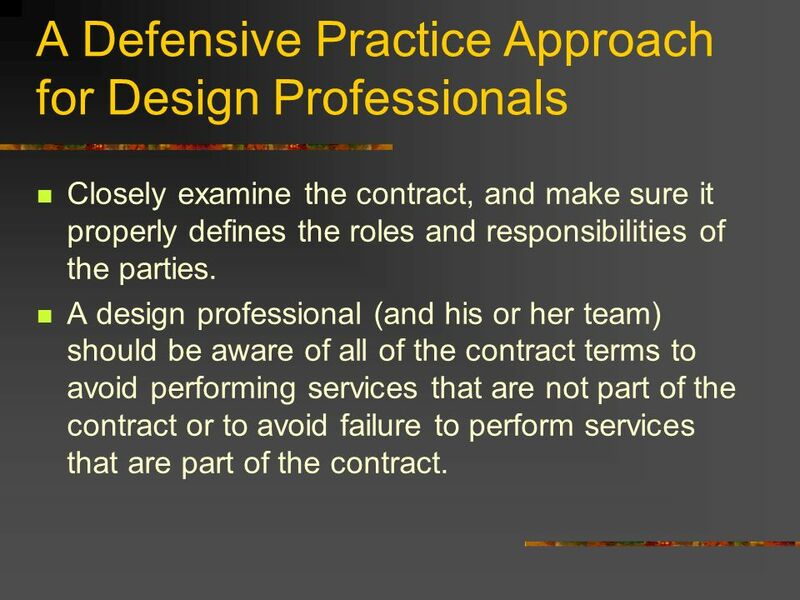 A design professional (and his or her team) should be aware of all of the contract terms to avoid performing services that are not part of the contract or to avoid failure to perform services that are part of the contract. 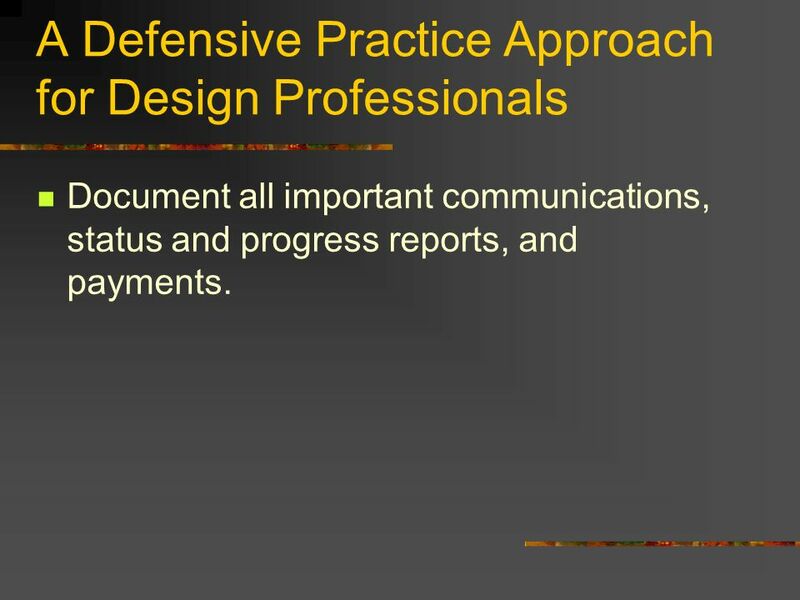 17 A Defensive Practice Approach for Design Professionals Document all important communications, status and progress reports, and payments. 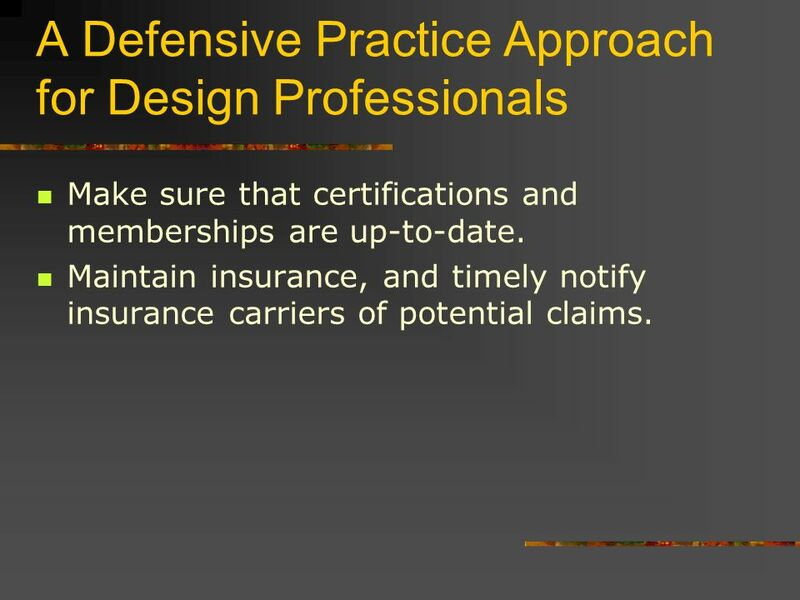 18 A Defensive Practice Approach for Design Professionals Make sure that certifications and memberships are up-to-date. Maintain insurance, and timely notify insurance carriers of potential claims. 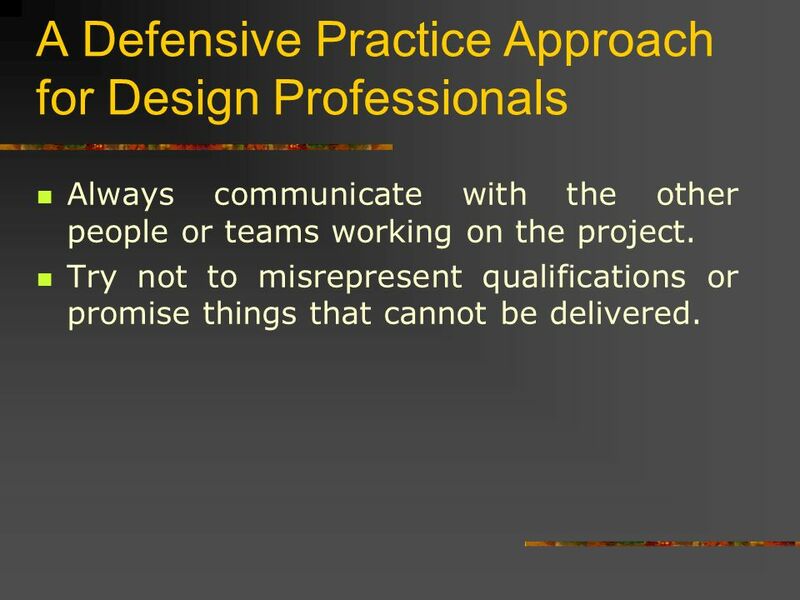 19 A Defensive Practice Approach for Design Professionals Always communicate with the other people or teams working on the project. Try not to misrepresent qualifications or promise things that cannot be delivered. 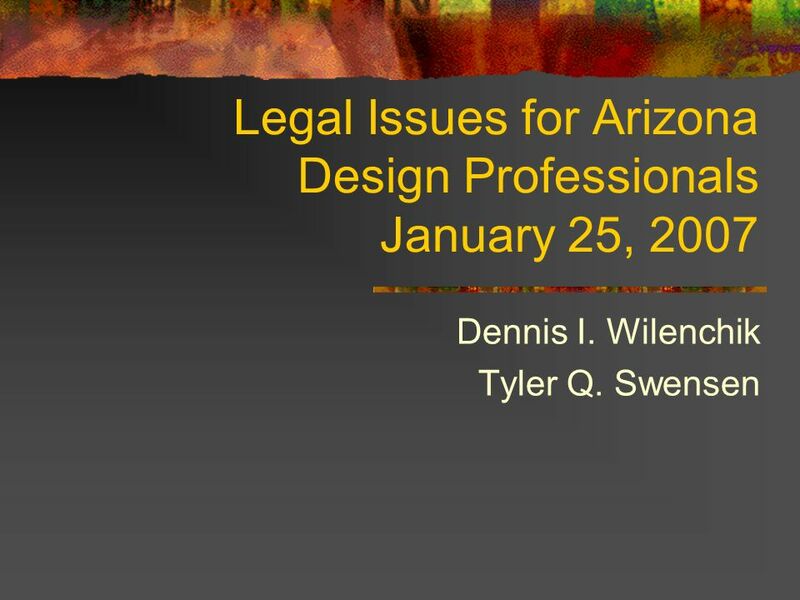 Download ppt "Legal Issues for Arizona Design Professionals January 25, 2007 Dennis I. Wilenchik Tyler Q. Swensen." Karen McKeithen Schaede, RN, JD. Criminal Law: Deals with crimes and the punishment for criminal offenses Examples of Criminal Law Failure to renew nursing. Chapter 16 Professional Liability. 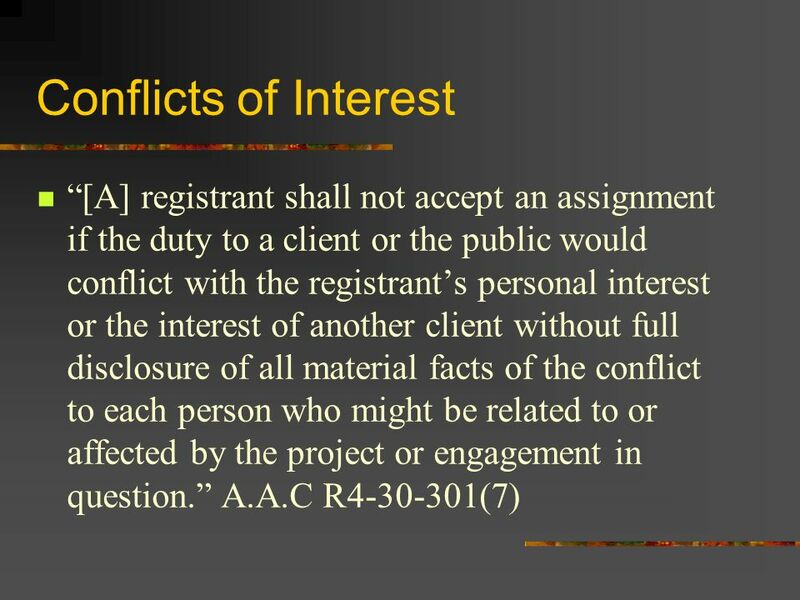 The Legal Environment Affecting Litigation against Auditors Liability that affects CPA firms is derived from the following. 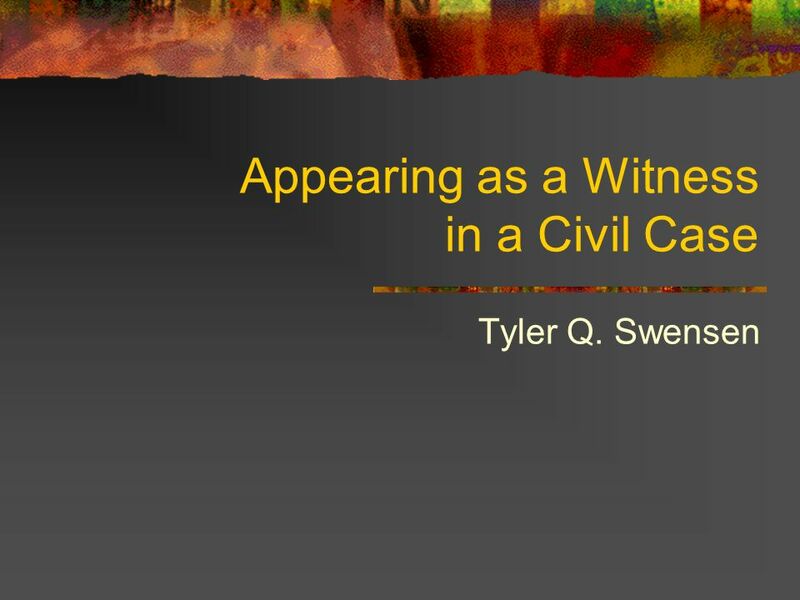 4Chapter SECTION OPENER / CLOSER: INSERT BOOK COVER ART Negligence and Strict Liability Section 4.2. Commercial Law (Mgmt 348) Professor Charles H. Smith Professional Liability and Accountability (Chapter 51) Spring 2009. McGraw-Hill/Irwin © 2003 The McGraw-Hill Companies, Inc., All Rights Reserved Chapter 19 CHAPTER 19 INDEPENDENCE, PROFESSIONAL CONTDUCT, AND QUALITY. Learning Objectives LO1 List some examples of potential civil and criminal litigation facing PAs. LO2 Apply and integrate the chapter topics to analyze. McGraw-Hill/Irwin © 2003 The McGraw-Hill Companies, Inc., All Rights Reserved Chapter 20 CHAPTER 20 LEGAL LIABILITY. The AMA Code of Ethics Could Egyptian Marketing Professionals Agree on a List of Rules, Perhaps Similar to This? The IMI Journal. Members of the AMA are. Rules of Professional Responsibility. 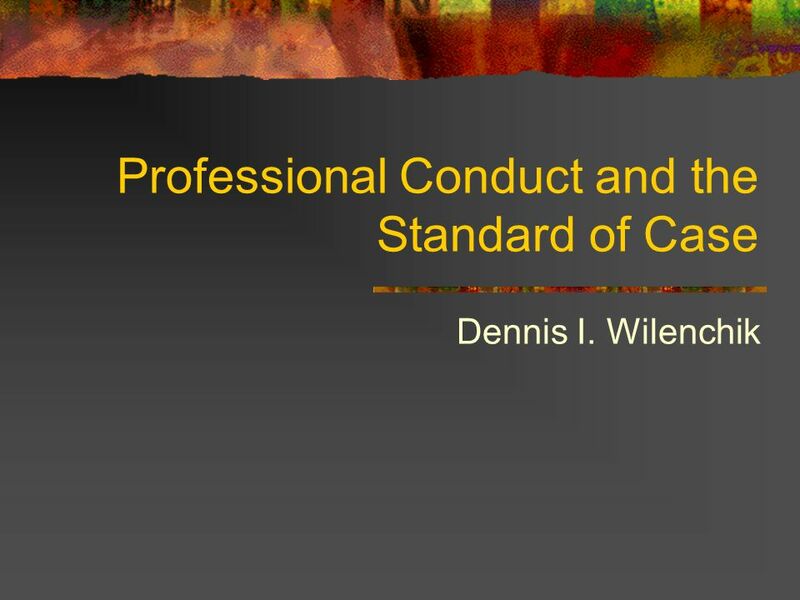 Scope w To establish and maintain a high standard of integrity, skills and practice in the profession. w To safeguard. © 2004 West Legal Studies in Business A Division of Thomson Learning 1 Chapter 52 Liability of Accountants and Other Professionals Chapter 52 Liability.